Helping Pet Adoption < Wet Nose Guide Featured Adoptable: Sid! Wet Nose Guide Featured Adoptable: Sid! The dog-lovers over at the Wet Nose Guide are at it again, promoting adorable pets for adoption! Here’s their latest featured furry friend: “I’m Sid. 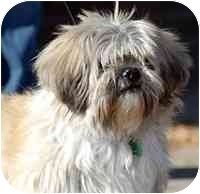 I’m a 6-year-old Lhasa Apso Shih tzu mix. I came to a shelter with my friend, Sam, who recently left to join his forever home. I know I’ll find mine because I have a lot to offer. I’m neutered, house trained, up to date with shots, and I get along well with other animals – even cats! I do have a tough time with young children, but I think that’s because I like to be the center of attention – I mean, check out my hair! I wear it this way so everyone will notice me! As I take pride in my coat, I do require regular grooming appointments. I very much enjoy walks (who doesn’t?) and glide along the street. That’s because you can’t see my legs too well with all this lustrous fur. Everyone tells me what a good boy I am when we go for walks, and I have to agree with them. I do prefer if people approach me slowly, though – no fast movers, please – so I can sniff you and determine where you’ve been. After I’m comfortable with you (it doesn’t take long), I’ll snuggle up to you with no problem at all. Oh, I forgot to mention, I’m not much of a barker. I think you humans prefer that, so this is good for me. But, don’t pass me by because I’m quiet! I sure would hate to miss the chance of our making a connection – and then maybe even going home together! To find out more about Sid visit his Adopt-A-Pet.com page!